Thoughts Arise: "The Da Vinci Holmes" / "The Sherlock Code"
"The Da Vinci Holmes" / "The Sherlock Code"
This is a note I first posted to FaceBook motivated in part by the recent Guy Ritchie film Sherlock Holmes. I am re-posting it here also so that it can appear with my other film essays. It is a commentary on a genre of insipid, hyperkinetic action-mystery movies that has - sadly - been growing in popularity in recent years. 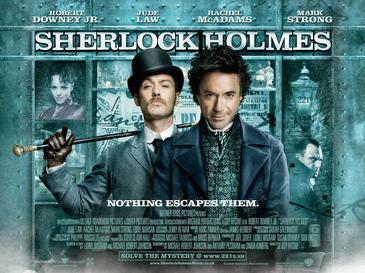 Egad, Watson, I could write one of these movies. - Pick a hero sleuth, an academic or intellectual outsider who knows how to throw a punch. - Pick a sidekick, a loyal friend or brother and / or, perhaps, a woman of mystery. - Pick a friendly cop on the inside, someone whose superficial disdain for hero sleuth masks a burgeoning respect. - Pick a villainous cabal led by an evil master as an adversary. - Pick a setting, cities with recognizable / picturesque locations work best because they are compact, making scurrying (see below) very practical; large amounts of money can be poured into period recreation and location shooting and the cost of writing the screenplay can, thus, be kept to a minimum. Once these elements are in place, set the plot in motion with some requisite crime, the murder of a tertiary character or the theft of a something of historical or artist value, and let the scurrying begin! - Have hero sleuth and sidekick scurry from recognizable / picturesque location to recognizable / picturesque location, ostensibly to nab evil master or thwart the progression of his nefarious, yet inscrutable, scheme. - Have scurriers arrive too late at said locations - too late, that is, to nab evil master, but not too late to avoid a dust-up with members of villainous cabal or their brawny minions, allowing scurriers to demonstrate feats of derring-do and their not inconsiderable talents at punch throwing. - Have friendly cop, optionally, arrive at said locations even later than hero sleuth and sidekick - too late that is to help out with the dust-ups, but not too late to demonstrate growing respect for hero sleuth and, occasionally, to place him under arrest. - Have hero sleuth surmise something or other as a result of each visit to a recognizable / picturesque location, not to advance the plot in any significant way, mind you, but to insure that the selection of the next recognizable / picturesque location on the agenda can be announced so that the scurrying can continue uninterrupted. Make sure that recognizable / picturesque locations geographically form the outline of some sort of geometrical figure or hokey religious symbol so that hero sleuth can divine - from a hastily drawn map - the last the recognizable / picturesque location to which to scurry for the climax and denouement. - Have hero sleuth, sidekick and, optionally, friendly cop, whose undying respect for hero sleuth is now firmly established, converge on the final recognizable / picturesque location where they engage in an urgent battle with evil master and / or members of villainous cabal and / or brawny minions as the objective of the nefarious scheme is announced and some sort of doomsday clock ticks away. - Have hero sleuth, sidekick and, optionally, friendly cop vanquish evil master, but not necessarily all members of villainous cabal; there are, after all, sequels to be considered. - Have hero sleuth deliver three-minute extemporaneous just-so-story speech, accompanied by flashbacks of scurrying to and from recognizable / picturesque locations, that explains evil master's nefarious scheme in excruciating scientific and scholastic detail so as to dispel any notion that magic or supernatural forces were implicated in its execution and to seal hero sleuth's reputation as the renaissance man extraordinaire who can throw a punch. Invest a small fraction of the not insubstantial production budget for the film in hiring writers who can develop characters fully, can write dialog that is more than an exchange of a handful of quips, and understand that the art of presenting a mystery lies in enlisting the audience as witnesses to its being solved and not as a classroom of schoolchildren to be assembled for a final lecture. "The Da Vinci Holmes" / "The Sherlock Code" by Marc Merlin is licensed under a Creative Commons Attribution-Noncommercial-No Derivative Works 3.0 United States License. I mostly agree with your assessment of this film. Had I not known about Sherlock Holmes from books and other films, it probably would have been a lot less enjoyable than it was. What enjoyment there was for me came from seeing old Sherlock perform like a contestant on ``Whose Line Is It Anyway?'' (and I liked the costumes, cinematography and music). The criticism at the end of your essay is exactly what I thought upon seeing the film: There was literally no opportunity for the audience to play detective right along with the characters, as one expects in a good mystery movie. The audience was expected to play the role of someone standing at the sidelines as a funny joke was told, and though the joke was not heard, was nonetheless expected to laugh from the mere suggestion that something funny was said. It is not surprising that the Da Vinci Code (and Angels and Demons) movie turned out to be a dud, as Dan Brown's books are terrible -- it's hard to make a good movie when one has so little to go on. They are page-turners, but when one looks more closely one sees he has a tin ear for dialogue... just awful. And his plots are ridiculous and the stories are full of scientific inaccuracies, leaving one with the impression he is not as worldly as he thinks he is. I must say that a book I enjoyed far more than any of Brown's (and I have read them all) is Katherine Neville's ``The Eight''. 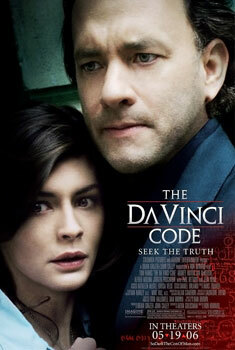 True, it has a ridiculous plot, but I found it to be much more sophisticated and engaging than the Da Vinci Code. I should say that I found "Sherlock" to be somewhat enjoyable for the of same reasons you mentioned - the convincing period reconstructions and the charming performances by Downey and Law. The disdain that I feel for this kind by the numbers screenplay - formulaic is too good of a word, algorithmic describes it more accurately - got the better of me when I went to write my essay. Like you, I really dislike these lazy attempts at mystery that insult the audience by dismissing their participation during the entire course of the film and wrap things up by delivering some sort of over-wrought just-so explanation at the very end. I will take a look at "The Eight". I know nothing about, and I appreciate your recommendation.